If you love conversation hearts and think it would be fun to make a a batch of homemade conversation hearts this Valentine's Day, then you will want to check out Bravetarts recipe for these traditional Valentine's Day candies. These tiny confections are flavored with dried strawberries and bananas, wintergreen and key lime extract, and even clove oil. 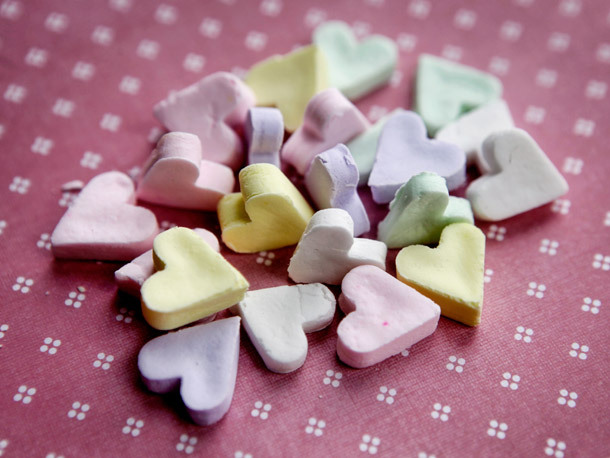 You can get the recipe for these DIY Conversation Heart Candies over at Serious Eats. And if you want to add the sweet phrases that they are known for, just pick up some food color markers and you can personalize the messages.